This year’s summit will be held at Phnom Penh, Cambodia from August 5-11, 2019. YLS19 will bring together young leaders from all over Southeast Asia. Participants will take part in capacity building and skills training, and be made aware of social issues through talks and workshops. Participants will be equipped to be effective project leaders to address important development issues in their community! This summit is organised by the Southeast Asian Service Leadership Network (SEALNet). We are a community of servant leaders promoting service leadership among Southeast Asian communities. We are passionate to serve and promote social change in Southeast Asia and around the world. 2. Fill up the application form at bit.ly/YLS19ApplicationForm. The form includes short essay questions, short project proposal section, one-minute video introduction and attachment of CV/resume. 3. Finish your application before the deadline on March 16, 2019. 4. Shortlisted applicants will be contacted and undergo an online interview. 5. Final participant list will be released in May. 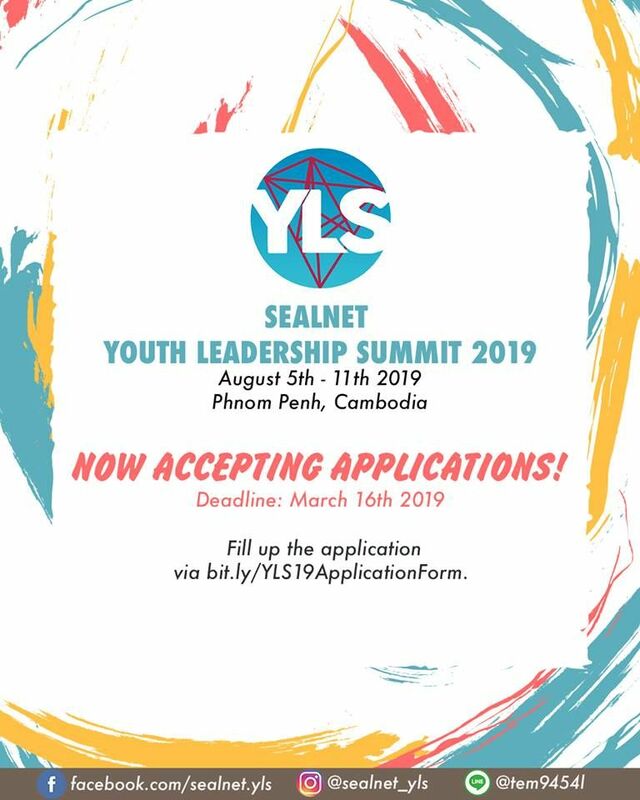 If you have any questions regarding the summit or the recruitment process, please refer to our FAQs in the Application Information Package or email us at sealnet.yls19@gmail.com. Alternatively, you can inquire through our Facebook page. We look forward to making impact with you!